The 17-year-old boy who smashed an egg on the back of Senator Fraser Anning's head has responded to the incident in a short video clip posted to social media. Will Connolly, from Victoria, was behind Mr Anning at a Conservative National Party Meeting in Melbourne, on Saturday afternoon, when he egged the senator. A short scuffle ensued and the schoolboy was grabbed around the neck, tackled to the ground and restrained by up to five men. The incident was captured in confronting footage showing the teen being arrested and later removed from the premises. On Sunday morning, the teenager posted a video delivering a stark warning to his burgeoning fan base. 'Don't egg a politician, you'll get tackled by 30 bogans at the same time, I learnt the hard way,' he says while laughing and slapping his face. Since the video of the egging went viral, the teen, who resides in the affluent Melbourne suburb of Hampton, has seen his online following soar. His Instagram now boasts more than 241,000 followers and his Twitter feed is flooded with fans calling him a 'hero' and affectionately renaming him Egg Boy. 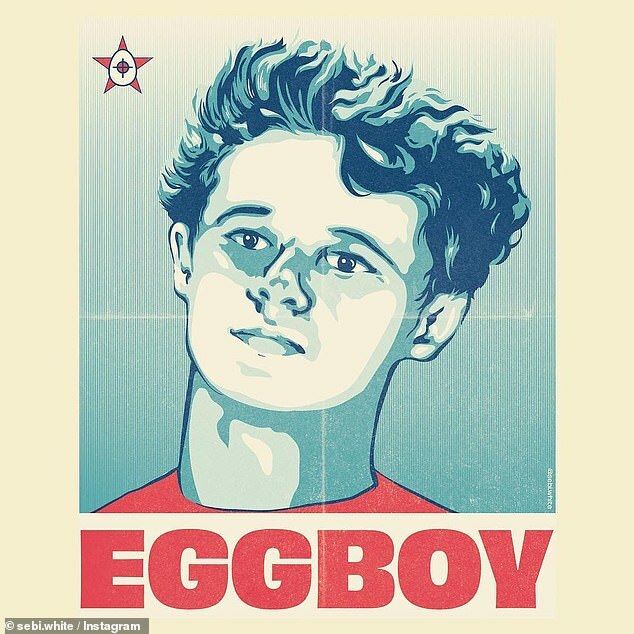 The hashtag EggBoyHero is now one trending on Twitter worldwide. 'Thank you for your love and support,' he has since written to his newfound fans. A GoFundMe page has also been set up to pay for his legal fees and 'to buy more eggs'. It has exceeded the $2,000 target by reaching more than $21,000 and is still climbing. 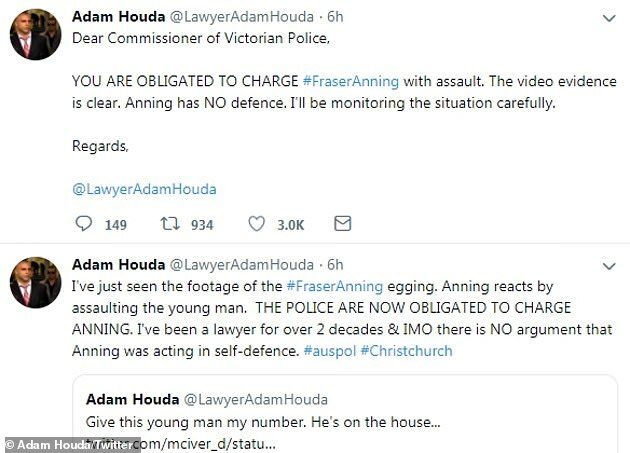 Since the video's wide circulation, Adam Houda, a high profile criminal lawyer who has defended men charged with terrorist-related offences in the past, is now demanding Mr Anning face charges for his actions. On Twitter, the lawyer said it was a clear case of assault on a child. 'I've just seen the footage of the Fraser Anning egging. Anning reacts by assaulting the young man. The police are now obligated to charge Anning,' he tweeted. Mr Houda, who is the former lawyer of Sydney Lindt Cafe siege gunman Man Haron Monis, has offered to represent the teenager free of charge. 'The video evidence is clear. Anning has NO defence. I'll be monitoring the situation carefully. Victoria Police released a statement saying they are continuing to investigate the incident 'in its entirety' including the actions of Mr Anning and others. Disturbing footage has also emerged showing Mr Anning's supporters holding the boy to the ground in a choke hold as others taunted the teen. 'You are nothing but a weak f****** human being,' a man could be heard saying. The egging came a day after Mr Anning released a statement where he blamed Muslim immigration for the terror attacks in Christchurch, New Zealand on Friday, where 50 people were killed. 'The real cause of the bloodshed on New Zealand streets today is the immigration program which allowed Muslim fanatics to migrate to New Zealand in the first place,' his statement said. He faced wide-spread backlash following the release of his statement. A Change.org petition calling for Mr Anning to be removed from parliament has been signed over 250,000 times. 'Senator Fraser Anning has no place in the government of our democratic and multicultural country,' the petition says. The petition speaks about Mr Annging's statements about the Christchurch attack. 'We call on the Australian government to expel this man who blames victims for their own violent deaths, and uses references to genocide to further his hateful agenda,' the petition said. Politicians have roundly condemned Mr Anning for his comments. Prime Minister Scott Morrison also hit out at the independent senator's comments in a tweet on Friday. Labor frontbencher Tony Burke told the ABC 'the normalisation of bigotry is something that is not only confined to him'. 'We need to call it out, we need to make sure that no way any member of parliament fosters it. He wants the conflict and he wants the notoriety,' he said on Saturday.